View More In Bluetooth Network Adapters - Page 2. This is a usb Bluetooth Smart Proximity Beacon With Eddystone, iBeacon Technology Transmission distance of more than 100 meters in open space. We updated the configuration software for this Eddystone/iBeacon dongle. With this configuration software, you can easily set the product parameters such as URL, or UUID.Very simple, do not need to remember a bunch of AT commands. Built-in CP2104 USB to TTL chip from Silabs, AT command accepted. We back this usb Eddystone/ibeacon dongle with 12 months warranty.If you meet any question, please contact us, we will fix your issue within 24 hours. Bluetooth Smart Proximity Beacon With Eddystone, iBeacon Technology. Requires No Host Computer, Powered By Any Available USB Power Source. 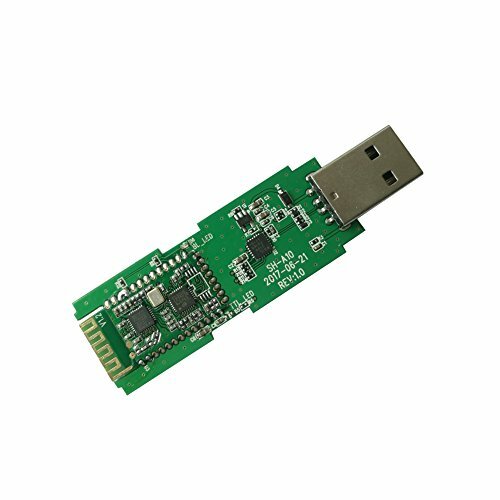 Built-in CP2104 USB to TTL module, You can control this dongle via the AT command. Fully Configurable, including URL,UUID, Major, Minor . Support URL string For Eddystone. With DSD TECH configuration software, you can easily set the product parameters such as URL, or UUID.Very simple, do not need to remember a bunch of AT commands. WARRANTY:DSD TECH back this usb Eddystone/ibeacon dongle with 12 months warranty.If you meet any question, please contact us, we will fix your issue within 24 hours. If you have any questions about this product by DSD TECH, contact us by completing and submitting the form below. If you are looking for a specif part number, please include it with your message. Amer Networks OWL-300HPR IEEE802.11A AND IEEE802.11N 5GHZ 300MBPS LONG RANGE OUTDOOR PASSIVE POE AP/CPE.